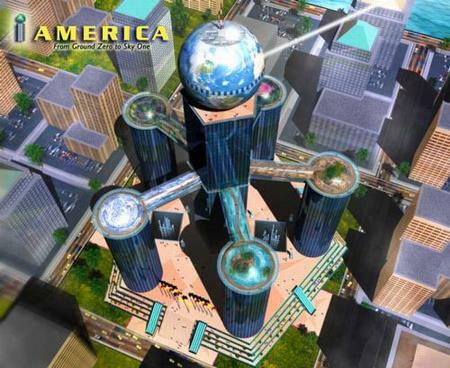 My friend Edmond Cohen created a vision, iAmerica, for what ought to replace the World Trade Center in New York. I don't think it actually got submitted to the contest, and it is probably too late. Anyway, I hadn't looked at the latest version, even though it is hosted on my server. But I just saw it, and I think it is fabulous. Much more worthy than the mishmash that came out of the contest. A globe on top, lighted up by LEDs showing an image of the planet. 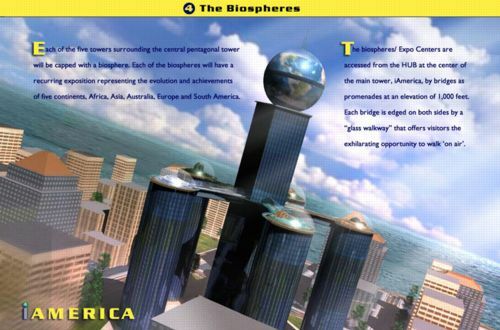 Five domed biospheres on top of five surrounding towers. but it certainly points our there to the future. I'd say that if one wanted to make a building that terrorists wouldn't think of attacking, putting a big globe on top of it would be a good move. I think it is a magnificent work I do not, however, think that any terrorist worth his BUSHel of salt would think twice about toppling it. I know I would'nt if I were a big T. I would, personally love to see an end to New York City as well as all other major cities and I'd like to see expansion away from them as centers of major enslavement. We are all dead anyway. Why do we need monstrous buildings instead of turning those intelligence powers towards ridding this world of the Global Enslavers and their insidious minions who build big buildings, construct huge cities, then turn around and destroy them as well as the denizens therein established? One big problem with this pocily it excludes nuclear power.The villains of the piece are the fossil fuel power stations. THEY should be the target of our party's condemnation not the n.p. stations.It should be clear by now that n.p. has underpinned our electricity production for decades and stands set fair to bear the load that a decline in fossil fuel burning will put upon our system as it becomes slowly more sustainable and renewable. Green' electricity provides yet a tiny proportion of our needs and wind wave and solar are largely inefficient and very expensive. (Yes, n.p. is expensive but it WORKS and on a large scale and is RELIABLE.) It will be decades before the renewables get close to matching fossil in scope. In the meantime we do not need to endure a hair-shirt environment on cold windless nights in winter if we can keep out nuclear compopment.It was noticeable that the vote at Conference last year on n.p.was greeted with the whoops and yells akin to the reception of a southern Baptist minister at a fundamentalist meeting in the Deep South of the US not an intelligent LIBERAL party in a Western democracy. It was a truly sickening moment. Our decisions should be based on reason, not hatred. If “all questions are wlcmoee in an unselective and un-spun way, then I congratulate you on this innovative and refreshingly open medium – especially so when juxtaposed with the policy of dealing with questions and interjections adopted by the Walter Wolfgang-ejecting People’s Party.Moreover, may I urge the Lib Dems display enough confidence in their policies and politicians to continue to include off-message questions and not just the mix of sycophantic and at best trivially unobtrusive – sometimes even apolitical – filtered offerings we’ve come to expect from occasions when mainstream parties organise “questions and answers sessions”? I genuinely believe this would show the party to its full strength – unashamed of its positions and clear on the inferences that’ve led to each policy.